Markets continued their bullish run yesterday with gains exceeding $1/bbl (1.7%), thanks to a large inventory stock draw reported by the API. The latest push boosted prices above $63, another multi-year high for crude oil, though prices fell slightly below the threshold before closing. Today, prices are continuing to push higher, with prices currently at $63.38, a gain of 42 cents (0.7%) over yesterday’s closing price. 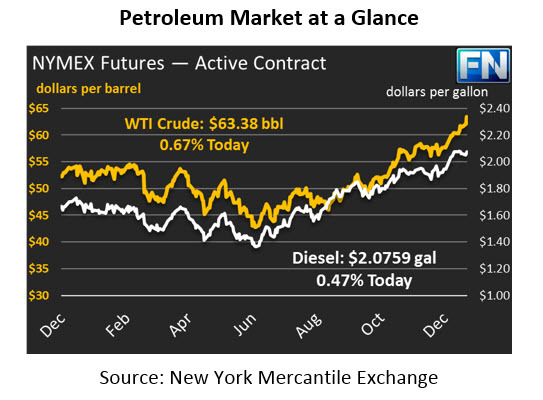 Both gasoline and diesel also enjoyed gains yesterday, though growth was uneven. Diesel prices, already considered by analysts to be higher than market fundamentals support, only added 1.6 cents (0.8%) yesterday. Today, diesel prices are playing catch up, outpacing gasoline with gains of a penny (0.5%) and currently trading at $2.0759. Gasoline has stayed closer to crude trends, seeing large gains of 2.8 cents (2.1%) yesterday. Gasoline has been underperforming market expectations in recent weeks, thanks to a cold winter shifting focus to diesel fuel. Today, gasoline prices opened slightly higher than yesterday but have since given up some ground. Prices are currently $1.8366, up just 0.04 cents from yesterday’s close. The API released their weekly inventory data, which showed large crude draws along with big product builds. The results were a bit of a surprise, given that crude inventories tend to rise steadily throughout the early months of the year before peaking in April and May. IN 2017, we saw diesel stocks buck the trend and show a net decline during the summer, the first time on record. Will this be the year that crude inventories buck the trend and fall during the winter? It’s unlikely, but we’re certainly off to a strongly bullish start. Markets received further support yesterday from reports that Venezuela’s production has fallen to multi-decade lows. S&P Global Platts noted that production in December fell to 1.7 MMbpd, down from highs of 3.0 MMbpd just a few years ago. Political and economic uncertainty have limited investments and stunted production growth. Further declines in Venezuelan production are possible if the country continues to struggle with its debt management. The EIA released their monthly Short-Term Energy Market Outlook (STEO) yesterday, and the report would seem to indicate a bearish outlook on oil fundamentals. The report forecasts a record high 10.3 MMbpd of U.S. crude production, and overall forecast a 2.0 MMbpd increase in production from Non-OPEC producers. Although the report did show that on average, inventories fell 0.4 million barrels each day in 2017, the agency believes oil stocks will average 0.2 MMbpd increases through 2018. The report of slightly oversupplied markets in 2018 was not enough to slow down an excited markets, so traders largely ignored the report’s conclusions.